On this night we celebrate the gift of freedom with special foods, stories and song. On this we night we have a seder! To help make your Passover even more festive, the JSA has compiled this special mix of holiday songs. This year’s Passover Music Mix includes familiar traditional songs and also many children’s tunes that educate as well as entertain. Click here to hear all 19 songs or to listen to your favorites. These songs were selected from albums on the JSA website. They are for your listening pleasure only. They may not be copied, reproduced or sold. All of the songs in this music mix can be heard on the JSA website all year long. 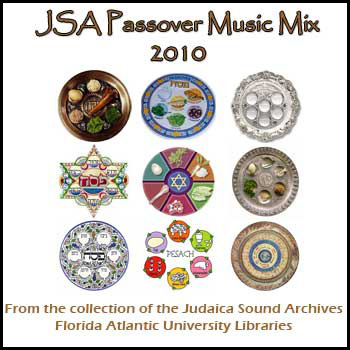 Selections from the following albums were used to create this 2010 Passover Music Mix. Chag Sameach/Happy Holiday by Judy Caplan Ginsburgh. Menorah’s Little Seder by Gladys Gewirtz. Mother Goose Rhymes for Passover can be found in the KTAV record label collection. Submitted by Maxine Schackman, JSA assistant director. Thank you for this brilliant idea, as time changes, we must be more and more creative too in educating our children about our faith. Through this, doing that is very easy.